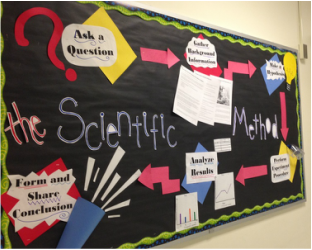 The grade you receive in science class will reflect both your effort in class and your mastery of the content. Multiple grades and a variety of grades will be taken weekly (including classwork, homework, and assessments). Homework- You will have homework every day. This completed work should be out on your desk at the beginning of class on the day it is due, Showing me homework on your computer or cell phone does not count for credit. It must be printed out or hand written in order to receive credit. Warm up- This should be started as soon as you get out your homework and get settled in class. You will have approximately 3 minutes to complete it. Warm ups will occasionally be collected as effort and mastery grades. Note Taking- Any notes taken at home or in class should be kept in a designated section in your binder. Classwork & Participation- This is the main activity of the day. It can include a brief reading with comprehension questions, group work, whole group discussion, lab activities, computer activities, and projects. Email & Google Calendar- Students should get in the habit of checking their email every day. All homework and classwork assignments, as well as important links and resources, are attached to the google calendar every day. Respect everything and everyone. This includes yourself, your classmates, Ms. Mann, and any classroom materials. Any homework or classwork will lose 10% each day it is late (this includes any time it's turned in after its due date and time). After 10 days, late work will not receive any credit. Please see Ms. Mann for policies for late projects and labs (there will be a larger penalty for late large assignments- the penalty will depend on the individual assignment). If you miss a day of class you are responsible for turning in any missed work. All missing work will remain a 0% until it is turned in and Ms. Mann will NOT run around to find you and your missing work. Turn in completed missing work into your period's turn-in bin. You will lose the equivalent of 10% for every day that passes after the work is due. You may collect missing work from the folders on the side of the room. Make-up work will remain in the folder for 1 week. If you know you will be out longer than a week or if you anticipate an absence, please email Ms. Mann before your absence so that she can collect make-up work for you. The first things students should do to improve their grade are to make-up missing work and make sure they are actively participating in class. If a student is doing those things and needs additional assistance they should speak to or email Ms. Mann with questions or times they'd like to come in for help. Ms. Mann is available every day at lunch (she has a DLA) and before school by appointment.